"We had a fantastic time Thank you so much for a wonderful stay, we had a fantastic time. Really appreciate now helpful you were with our ”special requests”. Thank you too for my husband's present! Our boys (4yrs & 2yrs) loved their first American trip, we hope to be back!" "Definitely will be back! The house appeared just as the pictures looked. We had looked at many different houses and felt that this house would fit our needs great. We had the limit of 10 people and had plenty of space. The bar-b-que grill was awesome too. The kids enjoyed the smaller kid friendly pool! Definitely will be back!" "A home away from home! The house was very clean, bright and comfortable. The kitchen had an assortment of dishes and pans to use. The master bedrooms and baths are very spacious. The pool and hot tub were wonderful and used daily. We would use the house again when we visit Florida! Thanks so much for a great stay!" "Great Stay! We had a great time at Andy & Maggie's place. We had everything we needed and could want. 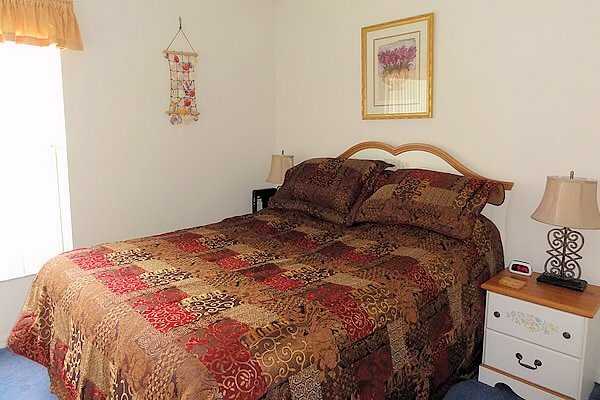 The place was clean, rooms were large and the beds were comfortable. The kids loved the scooby doo room and all the toys. And the kiddie pool let the adults relax a bit instead of constantly having to entertain. We would definitely stay again next time we are in town!" "”Great location! ” We enjoyed the nearby Shingle Creek nature park with kayaks, biking, running and walking trails. Convenient to shopping areas. Great house for our family. The children loved the games room, the welcoming stuffed animals and the heated pools! Well equipped kitchen. Thanks!" "Terrific place to stay! Three generations in FL visiting the 4th thoroughly enjoyed staying here! 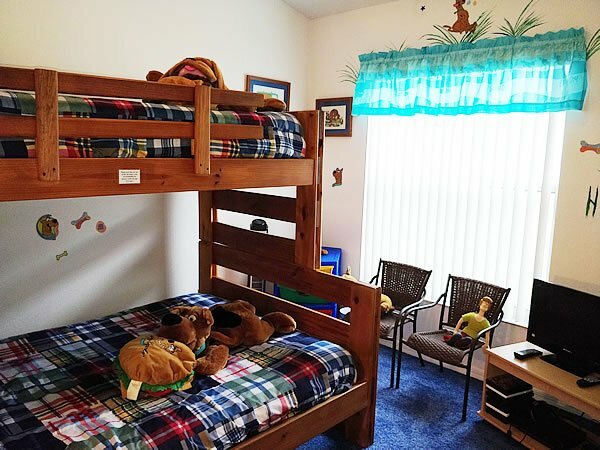 The children loved the warm pools, toys, games & cartoon decor of the bunk bed room. Everything we needed was on hand, and more! Convenient location! We enjoyed running, strolling, cycling and kayaking in the Shingle Creek nature/recreation area, and we enjoyed the Great Meadows Petting Farm--both very close by." "”Very homely” Fantastic property, very clean and tidy and most of all very homely. Very nice location and quiet and in a Superb location for all the parks, drive able with in 20 mins. 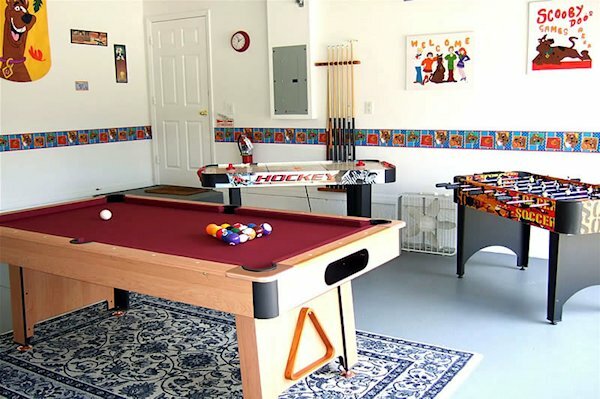 The games room was a big hit with the kids which comes in handy when mum and dad want to chill. Thank you so much for making our holiday so amazing." 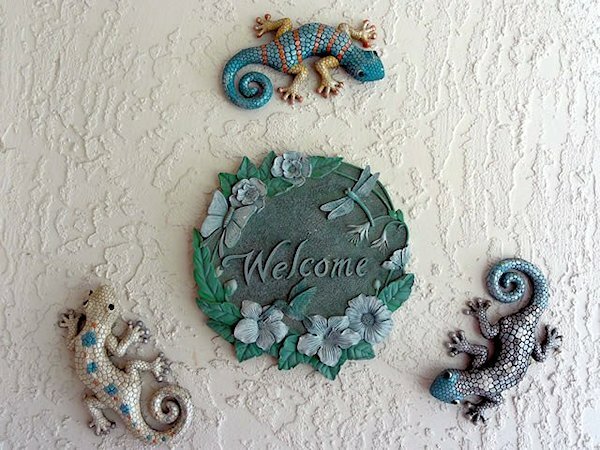 "”Fantastic time yet again...” and Floridahills has been improved even further with the recent updates. Our 4th visit and we will be back. Thanks again." "”A short drive to Disney” We spent a fun filled week in Orlando with our 3 year old son. This house was in a quiet neighborhood, yet only a short 30 minute drive to the Disney Theme Parks. My husband and I appreciated having the ample space in the house to enjoy the hot tub or watch movies after our son went to bed. We also liked being able to save money by eating our breakfasts at the home each day. Our favorite part about the house was the pool area. Even though it was December (and a little cool some days), the pool was heated and comfortable enough to swim in the afternoon. Our son loved the Kid's Pool, which is such an amazing feature for smaller kids! Overall, we had a wonderful time and would recommend this home to other families with kids!" "”Pool area was heaven” A very well equipped Villa in an ideal location and the pool area was heaven to our two young granddaughters also the arrival gifts for them was very well received." ""Every facility you could wish for" Excellent villa, great position and every facility you could wish for. The pool area with kiddies paddling pool, main pool and spa are ideal for all the family and all ages and the lanai was spacious and provides that necessary shade from the sun. Loved the games area and used the golf clubs frequently. Villa is only 3 miles from Kissimmee Golf Club (probably cheapest in Central Florida) and similar distance to the excellent shopping at The Loop. Half a mile away is Shingle Creek with great walks, bike trails and Kayak hire. We will definitely be back next year." 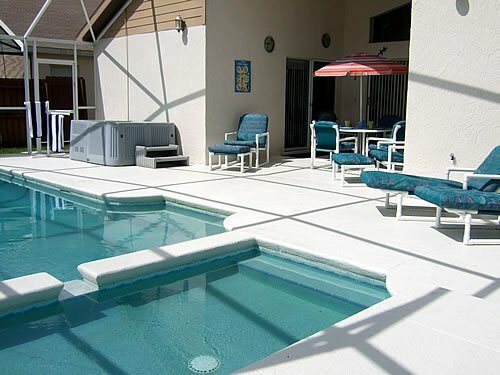 "When we decided to spend Christmas in Orlando, we knew that finding the perfect villa was important. Santa would be visiting while we were there, so we had to find the right house for this special time! We had a number of things on our check list and Florida Hills not only ticked these, it gave us many extras too! In particular, the children’s splash pool, gave us so much peace of mind. This pool, along with the games room was such a big hit with the children. It was heated at all times, so quite a few evenings were spent in splash heaven there! Location wise, its perfect, just off the bustling 192, behind Walmart. Lots of restaurants close by and of course only a 15 minute drive to Disney. I have no hesitation in recommending Florida Hills villa to anybody. We’ll be back. " ""Fabulous" Villa is fabulous, very, very homely and really easy for us to settle in with our 3 year old and 1 year old. The pool door alarm system was most reassuring with having the kids there also." "Lovely home from home. Nine of us stayed in the house, 4 generations, lots of space for everyone. Your information folders are excellent, informative and clear. Thank you all for making our holiday a problem free enjoyable experience we will certainly book again in the future. " "We had a great stay at a really lovely Villa! The added extras where really appreciated, these included some refreshments on the day of arrival and the additions of the games room. There was also great communication throughout the booking process and lots of information supplied before our holiday that helped with our stay. " "Fantastic Fantastic Villa, Fantastic service and Fantastic holiday had by the Powell Family. Many Many Thanks Powell Family, Heckmondwike, North Yorks UK November 2012"
"Ideal base for Orlando attractions We stayed at Florida Hills in late October 2012 with our young grand children. 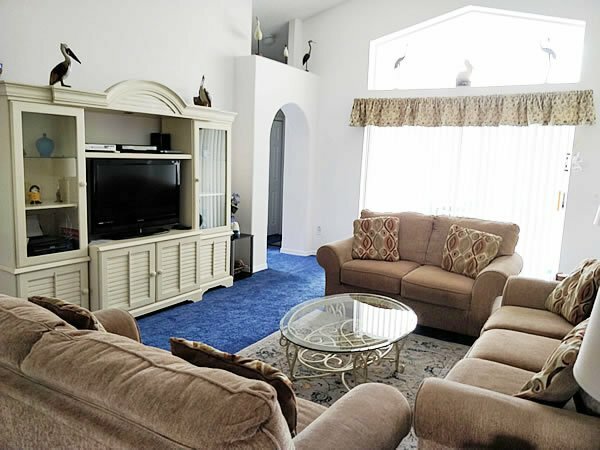 The villa is of a very high standard and it's location provides an ideal base for visiting the various Orlando attractions. The children loved the pool and games room on our rest days. Wilson family, Northern Ireland Oct 2012"
Rates quoted are discounted for Bank Transfer or Cheque payments, please note that paypal or credit card rates may be different. To book we require a non-refundable booking deposit of £200. The Balance plus refundable Security Deposit of £200 is payable 2 months before a stay. 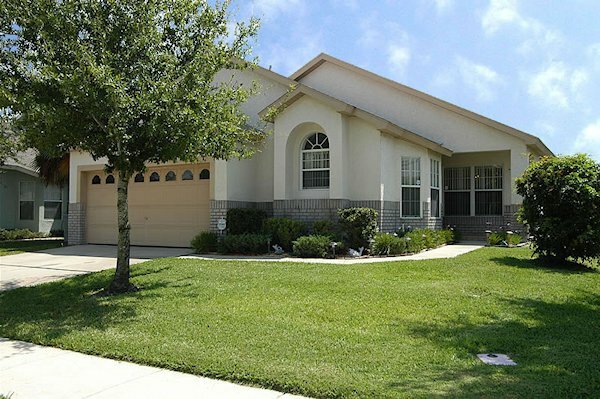 An established residential estate located half-way between the shops, bars and restaurants on US192 and the peace & quiet that Kissimmee offers. Indian Point offers open-plan one and two storey rental homes situated around a large central lake. There are great community facilities, which include a large communal pool with cabanas, beds and picnic benches alongside, a tennis court, basketball court and a children's play area. Alternatively, take a stroll around the lake and watch the wildlife. If you are looking to wear off some of those huge restaurant portions, follow 'Parcours Trail' for a self-guided outdoor recreational fitness program! 10 fitness stations based around the landscape for you to follow and exercise at. For essentials, the ever popular WalMart located on US192 next to Medieval Times is a little over 2 miles away and accessible through back-door routes. If you are looking for variety, a couple of miles up from WalMart is a SuperTarget and around a mile further along highway US192 (at the junction with SR535) is a Publix supermarket. In addition, there are also numerous shopping outlets on the US192 and the larger Lake Buena Vista outlet towards Walt Disney World on SR535. Eateries are equally abundant, with dozens of family-favourite restaurants located within a couple of miles of the Poinciana Boulevard-US192 junction. These include: Smokey Bones, Olive Garden, IHOP, Chillis, Mexican Grill, TGI Fridays and Longhorn Steakhouse (to mention but a few) - choice maybe your only dilemma! For something different, what about a themed night out - watching knights on horses at the nearby Medieval Times banquet or at Capone's roaring '20s buffet and show? 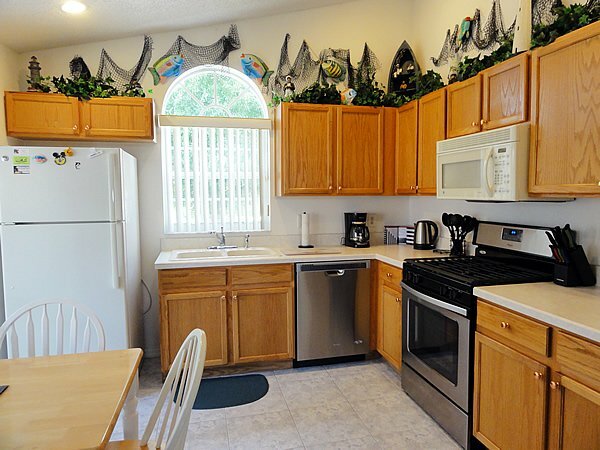 Large kitchen - Kitchen with table and chairs is fully equipped to a high standard with everything you should need. Lounge - The lounge is lavishly furnished and carpeted throughout with ceiling fan & 3 comfortable settees so settle down & enjoy the Large LCD HDTV with over 200 Channels, Hi-Fi and DVD Player. A selection of books, videos, DVDs & games are included for you to enjoy at your leisure. 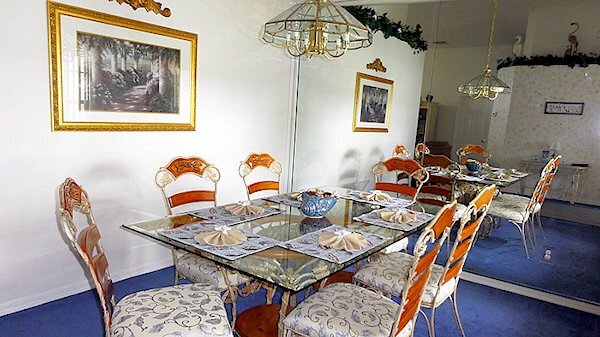 Dining Room - Magnificent mirrored dining area with glass-topped table and padded wrought iron chairs is the perfect setting for a relaxing meal with family & friends. 1st Master Bedroom has King-Sized bed, 32” LED HDTV connected to Brighthouse Digital and HD Channels, Telephone, Ceiling Fan and Large En-suite with his and hers basins, twin corner bath, toilet and large walk in shower cubicle. Bedroom 3 Scooby Doo’s Den with double bed, single over & a fold away bed awaits those who are “young at heart”. Enjoy the 19” LED Television with DVD player connected to cable channels & PS2 with games. Take pleasure from the books, games & toys provided. Bedroom 4 This twin bedroom is decorated in a nautical theme and has a 24” LED Television connected to cable channels, bedside table with lamp and a chest of drawers. Bathroom 3 has toilet, bath with shower over and a vanity unit. 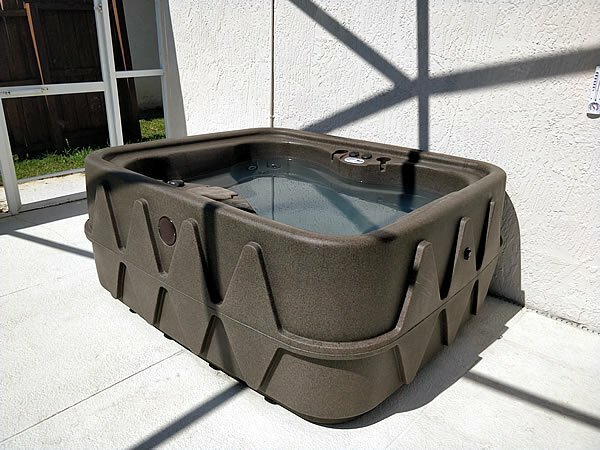 Hot Tub - Heated 24 hours a day! The Pool Area is fenced giving you privacy to enjoy the 26ft by 13ft Heated Swimming Pool, Heated Hot Tub and for our younger guests their own Heated Children’s Pool. The main pool is 3ft to 5ft deep, the children’s pool is 18 inches deep and the Hot Tub is heated 24 hours a day. The Extended Sun Deck area with luxury padded Chairs, Reclining Chairs, Loungers and Stools is a great place to enjoy the Florida Sunshine. The Lanai patio with patio table provides a covered area with an electric BBQ grill for those Al-Fresco meals. 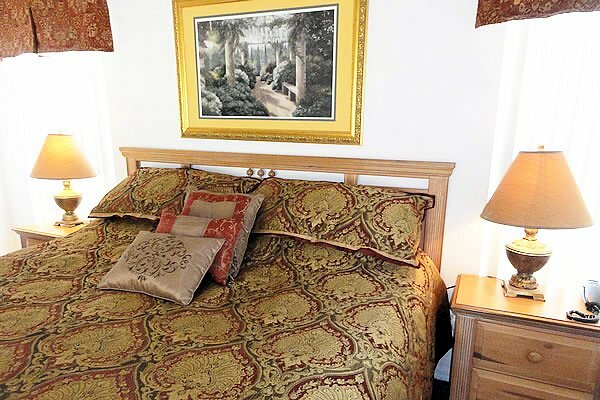 The villa is fully registered and licensed with the Florida State Tourist Authority and also has a fully monitored alarm system, smoke detectors and safe are installed for your peace of mind. Heated Pool, Spa / Hot Tub, Heated Children’s Pool, Games Console, Televisions connected to Cable Channels in all Bedrooms, Video Player and DVD Player with a selection of movies. All bedding, Towels provided, Cot/Crib with bedding, High Chair, Baby Monitor (On request), Alarm clocks, Beach towels, Safe, Hair-dryers and lots more to make your stay an enjoyable one!